The tremendous success of the book and film, “The Da Vinci Code,” inspired a whole cottage industry of other similarly themed works. 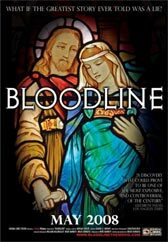 A new film entitled, “Bloodline,” is a documentary that further examines the controversial story surrounding the relationship between Jesus and Mary Magdalene and the so-called holy bloodline as well as the involvement of the Vatican, the Knights Templar and the Priory of Scion. It would seem that since the smashing success of films like the “The Secret” and “What the Bleep Do We Know?” a whole wealth of similar movies have been or are about to be released. Author Joe Vitale has recently said he is going to be in as many as seven new ones! The Opus Movie with guests such as Jack Canfield, Dr. John Demartini, Dr. Joe Vitale, Morris Goodman, Bob Doyle, Marci Shimoff, all of whom were in “The Secret,” among many others, is to be released in March 2008. This looks to be a film very much in the style of “The Secret” although the trailer suggests it goes beyond that film. Leap! Beyond Illusion is a film that compels you to consider this ageless theory: life is an illusion. We haven’t seen a trailer for this film yet but it looks very interesting from the web site. Guest stars include; Joe Vitale, Robert Scheinfeld, Fred Allen Wolf, and Dan Millman. “Try It On Everything” with guest stars: Jack Canfield, Joe Vitale, Cheryl Richardson, Bob Proctor, Dr. Joseph Mercola and Dr. Bruce Lipton is out now on DVD. This film is all about the healing method known as EFT or Emotional Freedom Techniques. Here's a classic video on the law of attraction from the long-lost author, Napoleon Hill of “Think And Grow Rich” fame, courtesy of Pat O’Bryan’s blog and YouTube.